WARKA WATER, WHAT IS IT ? 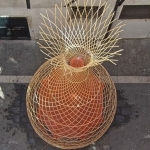 The Warka’s water harvesting technique and construction system are inspired by several sources. Many plants and animals have developed unique micro- and nano-scale structural features on their surfaces that enable them to collect water from the air and survive in hostile environments. By studying the Namib beetle’s shell, lotus flower leaves, spider web threads and the integrated fog collection system in cactus, we are identifying specific materials and coatings that can enhance dew condensation and water flow and storage capabilities of the mesh. The termite hives have influenced the design of Warka’s outer shell, its airflow, shape and geometry. We also looked at local cultures and vernacular architecture, incorporating traditional Ethiopian basket-weaving techniques in Warka’s design. WW is 31 ft (9.5 m) tall that weights only about 176 pounds (80 kg). It consists of 5 modules that are easy to assemble, from top to bottom, by the collaboration of 12 people in less than an hour. The elegant triangulated frame structure, made with local bamboo split elements, is optimized for lightness and strength and offers both stability and robustness. This frame structure is deployable to make easier the transport and the joints are then fixed with hemp ropes. On the ground there are 8 fixation points placed radially around the WW base from where a network of ropes, with different thickness, are attached to allow the tower more stability and to withstand strong winds.